She was born, the records say, 146 years ago today, somewhere near Gadsden, Alabama. That birthplace for Eula (Baird) Livingston Robertson — The Legal Genealogist‘s great grandmother — seems half a world away today, as I sit here in Indianapolis, getting ready to speak at the Indiana State Library’s Genealogy & Local History Fair. And, even more, it seems to me to be a lifetime away. Because I have no memories — none at all — of the brief time her life and mine overlapped. I wasn’t even three years old when Eula died, and I have only what I’ve been told to even be able to say that we ever laid eyes on each other. To me, then, Eula is for the most part a name in the records. And not even all that many records. There are no birth records for 1869 Alabama, and courthouse fires mean not a lot of other records survive for the area where she was born. And listing those facts would usually leave me profoundly depressed. Because, when it’s all a set of dates and places, nothing of the person comes through. Who was this woman? What did she love? What did she hate? What made her laugh? What brought her joy? I, myself, can’t begin to answer those questions. But it warms my heart to know that I am in the same state, today, with someone who does know some of those answers. 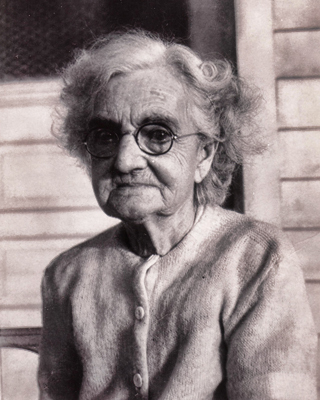 Indiana is the home of Thelma (Livingston) Dibble, Eula’s youngest and — at age 96 — only surviving niece. And Thelma remembers Eula. She remembers how, to help support herself after Jasper’s death, Eula took in boarders, among them her many nieces and nephews who came into town from country farms to attend school. And she continued to take them in and care for them as they went on to college — she was in essence the original dorm mom. She remembers that Eula wouldn’t brook any nonsense — yet cared for all of those kids as if they were her own. She wanted them to succeed. She urged them to buckle down and get ahead. She remembers that Eula had a soft side, that she scrounged her own mittens and scarf to send a niece or nephew out the door into the cold with a little more protection than the youngster would otherwise have had. And more than anything else… she remembers that Eula could bake. Bread, in particular. Bread that, Thelma said, was thick and filling and smelled like heaven. That, with butter and cinnamon and a little sugar, was a meal by itself. That, even now, all these years later, makes her mouth water. I don’t remember Eula myself. But I had cinnamon toast for breakfast this morning. I’m sure it wasn’t as good as Eula’s. But for just one moment, on this her 146th birthday, in the state where one person lives who does remember her and her bread, it was as good as it gets. This is a very sweet tribute to your great-grandmother. I too am hungry for more personal info about the great-grandparents I barely knew. It’s that “so close, yet so far away” sort of feeling. That’s a good way of describing the feeling! I love that you got these stories about your great-grandmother. I “met” my great-grandmother when I was a baby, and she died when I was three (three states away from me). However, I know so much about her because my mother was very close with this grandmother and has told me countless stories (which, yes, I am writing down and have even blogged about). So glad you’re telling the stories — they’re so important for us to pass on! What a moving tribute to a great grandmother you otherwise only knew from the vital records. I knew just one of my great grandfathers, but his wife, my great grandmother, died when I was one, and I have no direct memories of her at all. But when I was in my twenties, living 1000 miles away, her daughters and their descendants put together a cookbook honoring her. They included many of her favorite sayings, and I was thrilled to discover that I’d heard many of them come out of the mouth of my father, one of her grandsons, all my life. Now I knew where they came from, and now I knew a bit about the personality of this great grandmother. Some of the recipes were prefaced by “This recipe was originally Mama’s.” Her six daughters were all wonderful cooks, but I’d never thought before that the skill had probably come from their mother. So from the that too I learned a bit more about this great grandmother. What a lovely way for them to honor your great grandmother — and what a great thing for you to have. What a great story & great ‘find’. My grandfather’s family is just dates on records too and, unfortunately, will probably never be more. He was orphaned at 13 and we only heard about one sister “Aunt Jean” (even though there were 8 of 13 other living children) who I can’t even identify. I can’t even find any pictures of any of them. It’s nice that you’ve been able to find this treasure of information. Happy Birthday, Eula. I sure hope that someday you find someone who has some of your family’s clues, too. I had one great grandmother still living when I was born. She was my father’s maternal grandmother, born in Texas in 1867, and she lived in Oklahoma. My father never talked about his relatives, I don’t think he was especially close to them, and we lived in Florida. I remember being at her house once – and only once – when I was about 10 years old. I recall nothing about the visit except the heat and my going out to play in the dirt road neighborhood to get away from the boring grownups. Many years later, when I became active in genealogical research, I was stunned and heartbroken to learn she died at 100 years of age when I was in college. What a lost opportunity…..
We all deeply mourn those lost opportunities, don’t we…? I was honored to know two of my great grandparents – my mother’s maternal grandparents. I remember their faces so vividly but, sadly, I don’t remember much about them. My great grandmother lived until I was 12 and my great grandfather until I was 14 so while I should have some memories of them, those are fading away with time. I had just described to a family member about the STORIES, the longing to KNOW our family members when I read this! And to top it off, my great grandfather was born and lived in Cherokee County, Alaama, also! I’ve noticed places in your posts before that were familiar. It’s fun to hear about these little podunk places from one who knows how to tell a story..who knows the questions and has some pretty great ideas on how to find the answers. Because of your blog, I found one of most amazing stories ever! My 3rd ggrandmother married twice after deaths of two husbands, I paid little attention to those “extra” husbands until I saw the last husband in a mortality schedule..with Murdered as cause of death! I immediately began searching-won’t go into it all but months later, I found, Charlotte’s (3rd great..) TESTIMONY! It was sooo SOOO!!! She described how, at the sight of the robbers’ guns, she took off running! “I ran like I’d never run before! All the way to the tallest of fences, jumped that, to get to my son’s house!” Bear in mind that she was in her late 60’s at the time! I also found the case in an Arkansas Supreme Court decisions book and this, all thanks to you! Sorry to go on, but I love this story! In conclusion, I’d like to mention that one of those robbers was hanged at the courthouse! At MY courthouse! I had no idea! But how cool is that?!! Good for you for chasing down the stories of your family — and what a good one. Glad I could help a little in pointing you in the right direction. Here’s hoping Thelma has some good stories to offer about Eula! Incidentally, Thelma is a DNA match to my mother, aunt, brother, and me on chromosome 15. I’m baffled because this segment has Norwegian matches for us (which would be from my maternal grandmother) and I don’t see any Norwegian in Thelma’s ancestry. We do have Baird distant relatives but they’re descended from Scottish ancestors.